Car dealers often make big deals out of leasing. On its face, you can get a brand new, warrantied car that no one but the service tech had farted in for a price that rivals a value meal at McDonald's, per month. It's a win-win. But before you run to the ATM, let me explain why it's not the best fit for car enthusiasts. 4. You Don't Own Anything. Have you ever rented a microwave? Have you ever leased a toaster? Of course you haven't - unless you have - in which case, I'd like to study you. Ownership is an integral part of society, and in the case of cars, it can often create a sense of identity and pride for particular owners. Leasing a car, on the other hand, is essentially renting, as you're very literally paying for the privilege of using someone else's car. The car doesn't belong to you, and at the end of the lease term, instead of having a car that you now own outright, you leave the dealership without so much as a bus pass, but with a likely invitation to ride the bad investment train for another few years with another, newer model because ooh, shiny! If you're solidly on the lease new cars bandwagon, you'll be paying infinitely more than someone who just bought a car outright, because you'll always have a monthly payment. For people who always want the newest car and thus are used to always having a car payment this makes sense, but for gearheads who like to keep and cherish a car this is less of a great deal. 3. You're A Slave To The Dealer. I'm an outspoken advocate for buying used, not only for the extreme savings but the fact that at any point, I can change the color of my car, do an engine swap, add an aftermarket sound system, or decide to drive across the country multiple times. All things that a person is absolutely free to do when they own the car they're driving. When you lease, you're limited to the amount of miles that the dealer deems necessary for the amount of time you have the car. You have a 30-mile highway commute each way to work. If you work every week for a year, minus two weeks for vacation and sick days, that's 250 days that you have to make a 60-mile round trip. That equates to 15,000 miles per year. What's the average lease mileage allowance? 12,000. Sure, you can work out a deal ahead of time to get more miles, and that adds cost. If you constantly require a new car for commuting then maybe it makes sense, but if you're buying a car as an enthusiast and you want something fun to drive then, without even taking the car out on weekends or going to the grocery store, you're 3,000 miles over the dealer's allowed limit. 2. You're Screwed If You Can't Pay. Just as you're penalized for mileage, changing your mind or not being able to honor the financial agreement results in stiff repercussions. If you were to buy a car, or finance a new car and decided that "If I hear another door ajar buzzer I'm going to make sure I'm on the news tomorrow! ", you could sell the car for its value in the market to someone who doesn't mind knowing that they've been accidentally closing the door on their seat belt buckle for the past year. 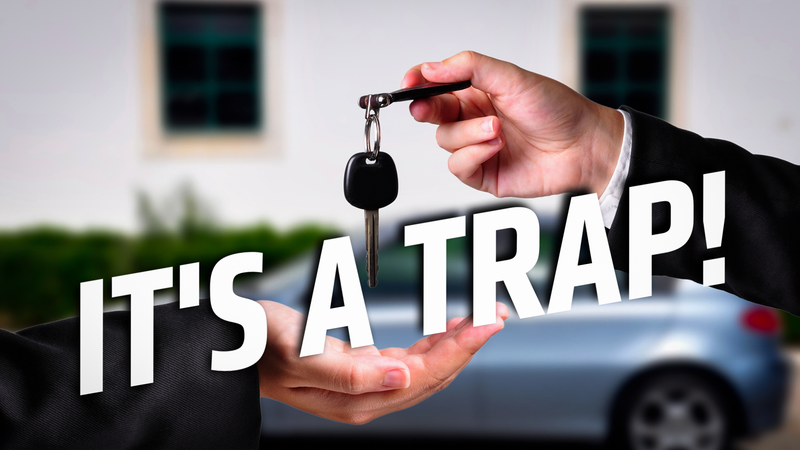 If you lose your job, the story is pretty much the same, as you can sell the car for whatever it's worth, and if it's financed, at least the cost of the sold car will be somewhat of a buffer before the repo company knows you on a first name basis. 1. You're Almost Literally Throwing Money In The Toilet. Let's conduct a thought experiment to put everything into perspective: Buyer A buys a three-door economy car that's three years old outright for $10,000 cash. Buyer B finances a new model of the same car for $18,000, at $500 a month for three years with 0% interest. Buyer C leases the same $18,000 economy car for $300 a month for three years. Buyer A's cost of ownership, excluding any maintenance, is $10,000. They also have the ability to sell the car at or near the original purchase price, as the car is approaching the end of its depreciation curve. Buyer B's cost of ownership, excluding any maintenance, is $18,000. They also have the ability to sell the car at the market value, which is around $10,000. They paid $8,000 in depreciation over 3 years but they do have an asset that they can leverage and use to their advantage. Buyer C's cost of ownership, excluding any maintenance, is $10,800. They do not have the ability to sell the car, because it does not legally belong to them. They may have the option of buying the car at the market price, which is $10,000, excluding any fees. So in order for Buyer C to be on equal ground with the others and have an owned asset, they'd have to pay $20,800 for a car that was worth $18,000 to begin with, a number which is double what the car is worth in the current market. Even if they didn't decide to keep the car, they're overpaying the depreciation costs by $2,800, not counting the mileage overages and any other associated penalties that they may have incurred. Had they saved this amount of money, they could've purchased Buyer A's car outright and had $800 left over. Leasing is a horrible idea for gearheads, as it's an investment that's 100 percent liability. While I don't advocate for financing, going down that path at least ensures that you're not forced to abide by strict guidelines and you actually end up with a product when you're done paying. The truth is, the best value will always be with buying used, and while there will likely be a drove of commenters at my neck trying to justify their questionable financial decisions, I urge the rational ones to dismiss the temptation of low monthly payments, dealer incentives, sparkly hoods and un-farted interiors. Remember, Febreze costs a lot less than putting thousands of dollars in the crapper and flushing.